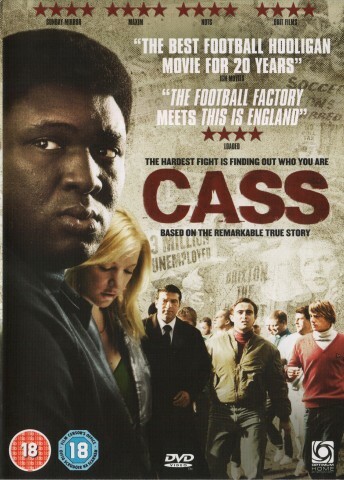 This week I received the DVD of Cass kindly sent to me from Optimum Releasing. Cass is a movie based on the true story of Cass Pennant who went from being an orphaned Jamaican baby adopted by an elderly white couple and bought up in an all white area of London to one of the most feared and respected men in Britain. He endured the typical racism of that time living and growing up in a white area of London and ended up being one of the leaders of West Ham's notorious hooligan Inter City Firm. As football hooligan movies go and there have been a few terrible ones , I actually really enjoyed this movie and not only because Rides "Leave them all behind " kicks in at a pivotal moment in the movie. The fact that the movie does not just focus on hooligans beating each other up and more on ( as the front of the Dvd informs us) that "the hardest fight is finding out who you are" is for me what sets this film apart in a big way from the other films made in this genre. I also attended the premier screening of this film last year in Leicester Square and not being a film premier kind of guy I was pretty amused at the after screening party when I met Cass Pennant the man himself along with Frank Bruno who is also in the movie, telling me that "Leave them all behind " needs to be re released. I wasn't exactly going to argue with these guys at the time but there are no plans as yet to re release this song ! Anyway once again Optimum Releasing, release yet another great British movie to follow on from greats among many others such as "Pan's Labyrinth" and all of Shane Meadows movies including "This is England" which was one of my favorite films of last year. One of the better footy hooligan films. Was surprised to see Ride included here but as you say, it fits in well .... and don't it sound great ... real passion. Hello Mark, Any new solo material/gigs in the offing please?! Hello. You' re probably fed up of these kinds of questions, but are you planning a tour of the UK at all soon? Plus , what about a Ride tour too? Saw you many times in early 90s. Still listen to your tunes regularly. Timeless!!!!! Hello let me tell u, u are amazing and ur songs blow my mind. Finally, somebody could send me the lyrics of "Story of the eye". Thanx a lot.